You should use data all the way to 2018. I think I've noticed a slight deceleration in sea level rise over the last two years, lately I can move my beach towel about 2 cm further away from the sea wall when I lay on the sand, and I attribute this to a 1,2 mm sea level drop. But I can't find a reliable up to date sea level graph. For some reason those aren't updated. Fernando, thanks for another demonstration of Tobis' rule, a denialist has located another short but noisy data series to prove something or other. The entire temperature record since 1880 is a short and noisy data series. As are hurricane / extreme storm records. 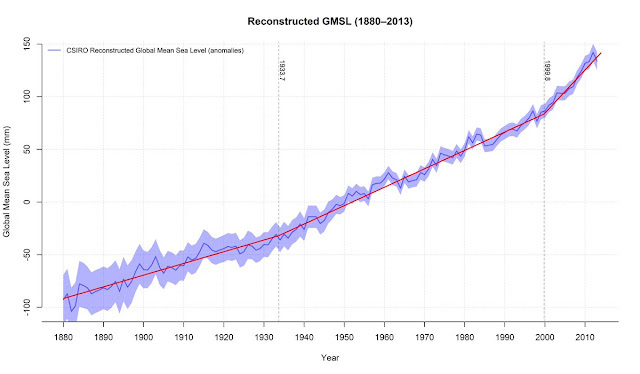 As are sea level records. It's fun to watch you argue so convincingly against your own interests. "you guys cut off the data all the time"
Fernando is the perfect example of people projecting personal defects onto others. Furthermore he is not even able to correctly read a short text that perfectly explain his defects. Using all available data is the longest and least noisy possibility. Using the most recent available data is not "cutting off" data. Besides these 2 observations, you're not doing well in other ways as well, but these are the most egregious for the moment. 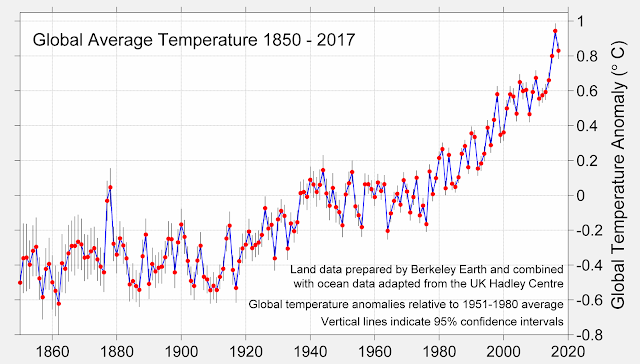 "The entire temperature record since 1880 is a short and noisy data series. As are hurricane / extreme storm records. As are sea level records." Ah, Tom, back to once again demonstrate that you don't understand the power of statistics in the proper hands. Keep on going though - history will know who to blame for the obfuscation that's leading us to perdition. That's not quite the image that was in IPCC(1990), but looks identical to the on used by John Daly, Steve McIntyre, Wall St Journal, Inhofe's book, etc. See MedievalDeception 2015: Inhofe Drags Senate Back To Dark Ages. There are books with a dozen or so slight variants of that sketch, the most amusing being Singer & avery(20070< where they ascribed it to IPCC(1995) & weere copied (but not attribut3ed) by 2 later book authors. '"Neither side has any credibility by now"
The side that lost every round of the debate, and now wants to kick over the table rather than admit error. This post is about arguing with the denierati about facts. We have been doing that for two fracking decades. Time to stop; redirect our efforts toward more deserving topics re solutions. 1) Should our RE future be publicly-owned and as cheap as possible or should we just let the profiteers take over? 2) Is a carbon tax the worst popular idea of our lifetime or just the second worst? Seriously, we need a *real* in-depth conversation on what the term means, whether it could possibly work at all, how it should be measured for success if we do use it, and whether it is the best way to move forward in the timeframe open to us. So, the 20-year long campaign of arguing with morons and liars about facts has not only been a losing proposition, but is doomed to failure because they gotz the money not us. Therefore, we should continue arguing with morons and liars about facts? Because, you say, "attempts to move on to solutions are likely to be hopeless". I disagree. Even Republicans support renewable energy when they can make a buck from it. Even Republicans resent paying through the nose for something. Well, perhaps the way forward is to propose a plan for RE that will put money into all of our pockets instead of into the coffers of Exxon Mobil. That means RE at the lowest possible cost. Hence why we need a sustained national conversation on public vs private ownership of our RE future; structuring of incentives (carbon taxes/ subsidies); mandates, etc. Right now, in the U.S., we spend about $1.5 trillion per year on fossil fuels, about $3500.00 for every single person. A big brand spanking new 100% RE system should cost between 6 - 15 trillion dollars. Longevity of RE systems is at least 30 years, likely 2 or 3 times that. That is a very persuasive argument, don't you think? Gingerbaker, I became involved with renewable energy systems back in '73, installing what I believe to have been the first "modern" wind energy system in California. I've been following things with great interest since. I live in a super insulated solar heated house I built myself, which provides a good fraction of my heating during the winter, but I still rely on propane for much of my heating needs. I think it's wonderful that PV is said to be competitive with fossil fuels, though the cost numbers aren't as clear as some would like to think. Depending on the particular installation, PV capacity may be less expensive than coal, but there's the big problem of meeting demand during night time as well as periods of clouds, which produce no output. Wind generators have grown to very large sizes since I installed that little 2kw system, though there are still the usual problems with demand matching. Adding storage helps, but there's the occasional period with not enough supply to meet demand. With grid connected systems, as the fraction of renewables increases, the intermittency problem becomes even more severe, IMHO. It seems to me that ultimately, there would need to be a complete secondary backup available to meet the entire demand, even with interchange between different regions. Renewables are more likely to suffer damage during extreme weather events, as we saw in Puerto Rica after hurricane Maria. I saw photos and videos of large areas of smashed PV panels and wind turbines splintered after the winds subsided. The electric grid in Puerto Rica is still being repaired, as I understand it. Storm damage such as that over the US East Coast region in winter would be a deadly catastrophe. Well by now you ought to know enough to be pro-nuke. So-called nuclear waste is a beneficial consumable in a fast neutron reactor. Which has been known since at least the 1950s. All the so-called problems are political, not technical. You could study the matter, possibly starting with Michael Shellenberger's recent piece in Forbes. Yes, let's just build breeders. That gets rid of the waste problem. Of course, then you have weapons-grade material being shipped all over creation, ripe for hijacking. That would sure be worth it. Weapons grade plutonium only exists in weapons or in the single repository in other than highly diluted form. The once through nuclear pins from a light water reactor are a mixture of isotopes of various actinides and some actual waste products. These are quite safe to ship in dry casks. The Navy routinely sends theirs to the Idaho National Laboratory reservation outside of Idaho Falls. Separation of Pu is chemical and thus easier if you have a few people willing to die for the cause. Even building a hot cell for the separation should be a lot easier with robotics. Benson, I was talking about breeders, not LWRs. Nice sleight of hand, but a full-scale breeder economy would involve weapons grade material, not LWR waste. The result will be a mixture of isotopes, almost all of plutonium. It won't explode, irrespective of geometry and even with the very best of George Kistakowski's pyrotechnics. John von Neumann went to New York to obtain enough computer power to ascertain that only single isotope plutonium would do. Even so, the device required testing in the New Mexico desert, unlike the uranium bomb which was never tested, just used. In summary, once through nuclear pins from light water reactors can only supply bomb components at a cost greatly in excess of simply centrifuging natural uranium. That is what India and Pakistan do and maybe what other countries were trying to do. It doesn't have anything to do with nuclear power plants. Well, to run a fast neutron reactor one has to have a supply of plutonium to start with. Turns out that once through nuclear pins from light water reactors provide a starting point. But all fast neutron reactors, whether run as breeders or consumers of plutonium, produce a mixture of isotopes of various actinides and some actual waste products. The mixture of isotopes of plutonium, even if chemical separated from all the other stuff, is not explodable. See my just prior reply to Eli. Describes the EBR-II fast neutron reactor and the so-called pyroproccessing of the "fuel" elements. It is the basis of the GE-Hitachi PRISM reactor. More likely because a) isotope separation became a spin off private company and b) a ton of weapons grade uranium was decommisioned, and diluted and sold to the US by the Russians. a and b killed the AVLIS laser isotope separation project too. Eli has some mirrors from it if you want a souvenier. For the original cancellation blame John Holdren. For the current MOX fiasco, blame the construction managers who have proved unable to repeat the French @ La Havre. But building that monster is a far poorer idea than using a brace of GE-Hatachi PRISM reactors to denature all the excess weapons plutonium. Sorry, more likely what? I assume that you are discussing uranium isotope separation? This captures some of what happened. Basically enriched uranium became cheap because of excess capacity and a flood of denatured weapons grade hitting the market.